Mad Men's Bryan Batt shares his best advice for entertaining this summer, be it a quiet supper, sit-down dinner party or all-out bash. 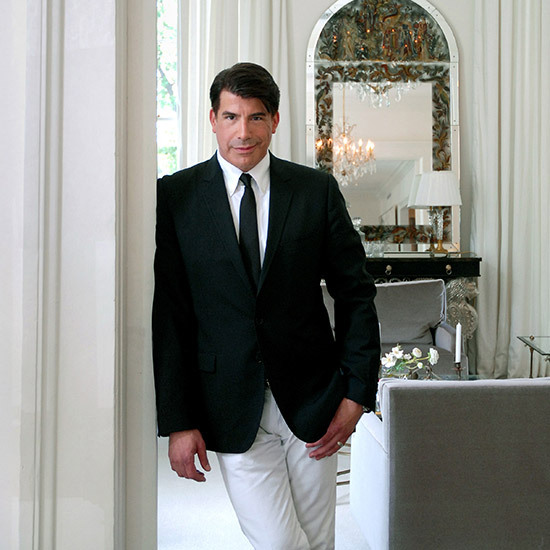 As Salvatore Romano on Mad Men, Bryan Batt’s artistic flair inspired Sterling Cooper clients. In real life, Batt is the owner of design store Hazelnut New Orleans, author of Big, Easy Style and a regular party host. And although most people go casual when the weather gets hot, Batt sticks to his signature “swellegant” style. Here, he shares his best advice for entertaining this summer, be it a quiet supper, sit-down dinner party or all-out bash. If you missed Batt on Mad Men (his character was unceremoniously fired in season three), you can catch him in the new MTV series Scream, premiering June 30. 1. Light with lanterns. When Batt and his longtime partner Tom Cianfichi tied the knot last September after 25 years together, they opted for an outdoor ceremony and reception. They set a magical mood with battery-operated LED paper lanterns. They’ve continued the tradition when throwing outdoor parties at their home, lining their courtyard and porches with colorful lights. Their go-to source: paperlanternstore.com. 2. Stay cool. The average August temperature in New Orleans is 90 degrees. That doesn’t stop Batt from entertaining outside. The key to keeping guests comfortable? Outdoor fans. Besides creating a cooling breeze, fans are a chemical-free way to keep bugs at bay. 3. Keep cocktails classic. Batt’s current favorite is the French 75, which many remember from the movie Casablanca. Although the traditional ingredients are gin, Champagne, lemon juice and sugar, Batt takes his cue from NOLA’s French 75 Bar at Arnaud’s and replaces gin with Courvoisier VS.
4. Upgrade your tableware. Batt loves to break out fine china, even if he’s just having guests over for fried chicken. Cloth napkins instantly upgrade any event, and it’s better if they don’t match; a wide array of colors looks beautiful on any table. 5. Order in. There’s no shame in take-out, but put it on a stylish platter. Batt opts for sushi served on a Beatriz Ball Collection banana leaf platter (available from his shop). The shiny alloy looks just like silver, but it never needs polishing and can go from freezer to oven. 6. OYSTERS! Batt prepares his in the style of his hometown Drago’s Seafood Restaurant, brushing them with a sauce of garlic and butter, dusting with Parmigiano-Reggiano and Romano cheeses, then cooking in Loftin Oysters stoneware. It's serveware that can go directly onto the grill (and later, into the dishwasher).